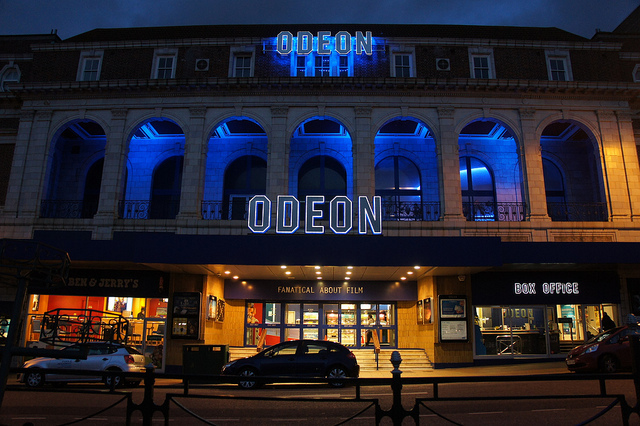 The Leicester Square Odeon says it’s £40 cinema tickets are great value compared to sporting events or theatre shows (nobody mention Netflix). Given this, the Odeon cinema in Leicester Square’s decision to charge £40.75 for front-row seats is a bit odd, because people don’t seem to want to go to the cinema much anymore. Box office sales have gone way down in recent years, probably due to the popularity of streaming services like Netflix and Amazon Prime. Both give people way more bang for their buck - Netflix alone offers customers over 4,000 films for around a tenner a month. But Odeon feels confident they can make money from their pricey tickets, because they’re offering up an experience than no living room can beat: high-tech image and sound quality, “sumptuous comfort” (aka squishy seats) and a tray table so you don't have to shove both your sweets AND your fizzy drink into one hole. Tbf, there is a trend towards people wanting to spend their money on experiences (rather than just stuff). But whether Odeon’s cinematic extravaganza will manage to match all the appeal of ‘Netflix and chill’ remains to be seen. Read our explainer on consumer choice theory.